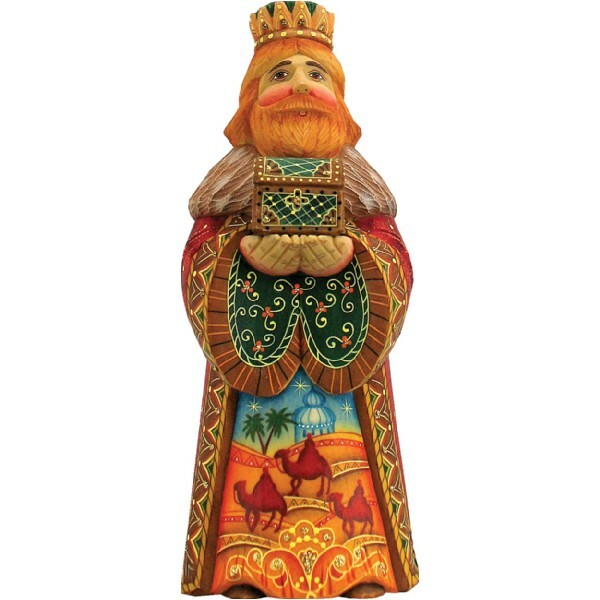 Folk Nativity King Melchior, hand painted, in wooden presentation box. No two sets are identical. 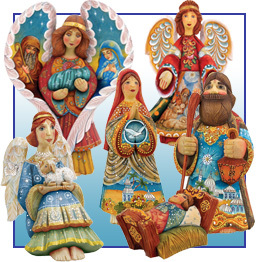 All Masterpieces are hand-carved out of seasoned wood, and travel from one Russian village to another to be hand molded with a wood based resin, then free-hand painted in all different styles of scenery and ornamental painting by the most experienced artists. As in all design processes created from the heart, the best work is created spontaneously and in different variations of colors and forms. This is why each is a true masterpiece. Each sculpture is an original work of art! Each collectible comes with a gift box or authentic logo on ornaments and a numbered certificate, certifying that your edition is an Authorized G.DeBrekht Artistic Studios Creation. Most of our Derevo collection is a limited edition. Each Limited Edition collection is Unique, Hand painted, and signed and numbered by the artist. Madonna & Child Hand Cast Stone Made in U.S.A.
Angel Watching Over Nativity Aged Hand Cast Stone Made in U.S.A.